Although many of the dives we make are in tropical regions, Diving Equipment has an international perspective. It covers a range of conditions; discusses laws and regulations in different parts of the world; suggests what to look out for and what to ask locals about. Anyone who asks technical questions will often be directed to have a look at equipment manufacturers’ websites, but those have limited descriptions of how equipment really works. This book aims to plug the gap. Diving Equipment also includes some less common and older items for interest and historical comparison, and finishes with some speculation on what the future might bring. 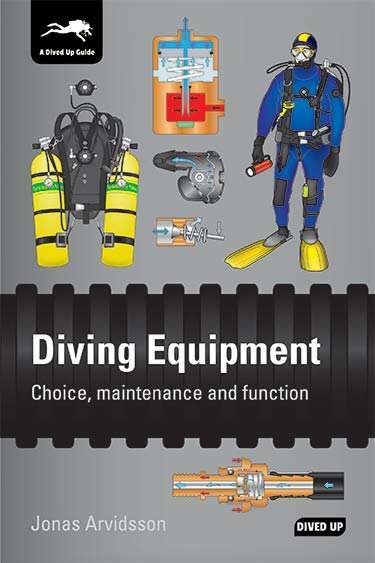 Click this link to view our free online preview of Diving Equipment. Jonas Arvidsson is a former Head of Education at PADI Sweden, dive centre owner and PADI Course Director. He translated nearly all PADI training material into Swedish and has also instructed in Australia, the Philippines, and Thailand. A former biology and chemistry teacher, Jonas is now a writer, illustrator and translator. See www.a-pub.se for more. This English-language second edition which has been completely re-edited and enhanced. Originally published in Swedish in paperback and ebook, and in English as an ebook.